The Mommy & Me class is a 45 minute class that the parent & child (18 months to age 3) do together until the age of three. The child will learn the beginning basics for gymnastics and all the necessary motor skills for early development. The parent will learn how to help their child with mild spotting and coordination exercises. This class is a great time to bond with your young one while teaching about their body through safe exercises and stretching. 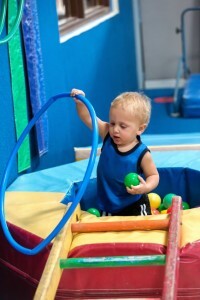 The Tiny Tot class is a 45 minute class that the child begins to work without the assistance of a parent. This class is for boys and girls 3 years of age. At this very important pre-school age, the child will learn many skills that will prepare them for school. They will also begin to learn many more gymnastics basics through the use of “activity stations” demonstrating all 4 Olympic events with stretching and conditioning. This is one of the best ages to start your child in gymnastics. 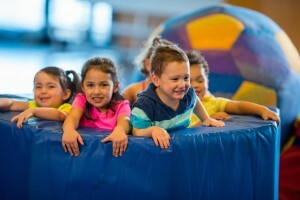 The Kinder Tots class is a 55 minute class for boys and girls ages 4 and 5 years old. During this class the student will begin to learn routines on all four events. They will also develop memorizing skills, coordination, balance, spatial awareness, colors, counting and last but not least, left from right. All these skills are necessary in gymnastics and they will only help them even more in Kindergarten.